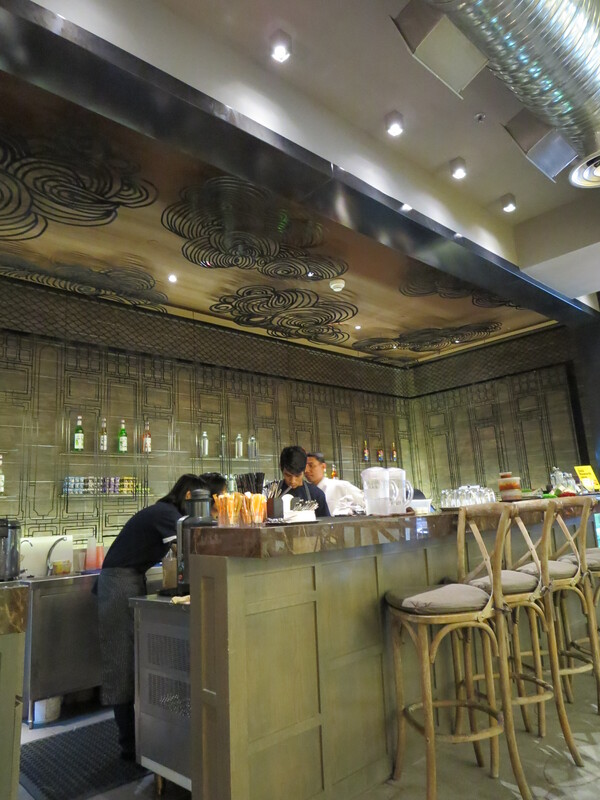 The last time I was at Harrod’s Cafe at Suria KLCC, I noticed that there was a new bistro opposite serving Malay food. Melur & Thyme it was called, but somehow, I couldn’t help getting the name confused with ‘Melur & Telur’ , I guess ‘Telur’ rhymes better with ‘Melur’. To those non-Malay speakers out there, ‘melur’ means ‘jasmine’ and ‘telur’ means ‘egg’. As we had just landed in KL from Hong Kong. I wanted to check out the Diane Von Furstenberg shop here. In particular, I wanted to buy the silver beaded top shown in the SS13 catwalk collection which was sold-out in Hong Kong. As luck went, no luck for me, I couldn’t find it in the shop, I did notice that the DVF here is more expensive by probably 20% . No bargain for me, since I can get 10% off all tax free DVF stock in HK. Mom and I ordered Mint Kombucha which we saw advertised on the blackboard on our way in. 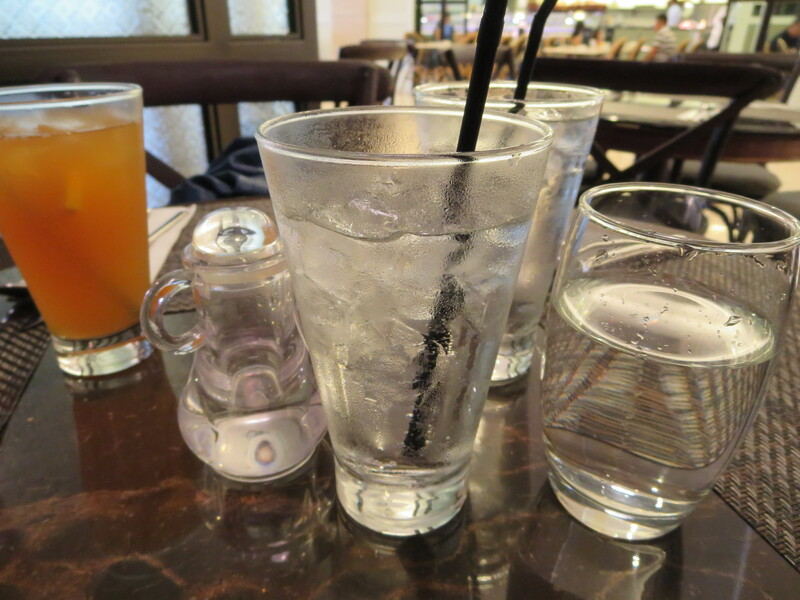 What arrived were 2 very sweet drinks, tasting like Sprite and can be passed off as Sprite. Isn’t Kombucha a probiotic tea drink, so it should at least look a teeny-weeny brown? Moreover, there was no hint of mint and this left me puzzling whether I got the wrong order… and whether the scrounge on a sprig of mint? 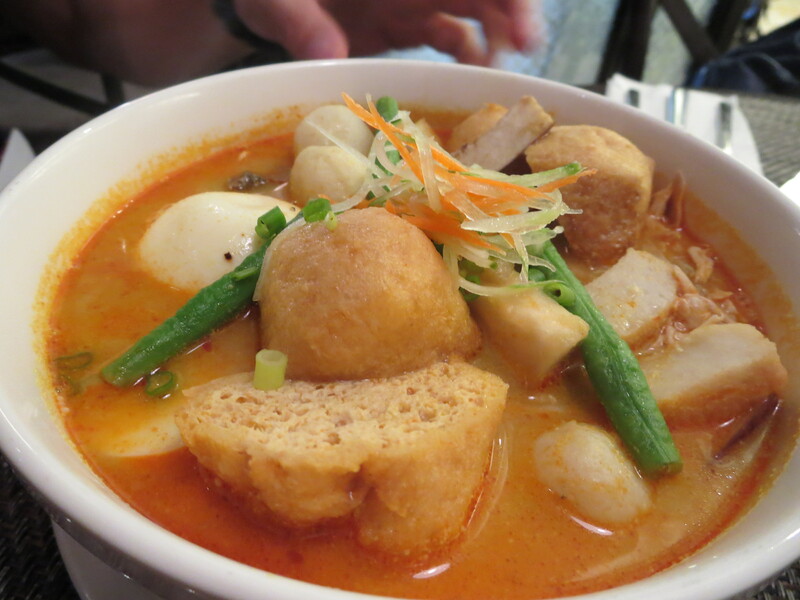 The menu is lengthy mix of Western and Malaysian. 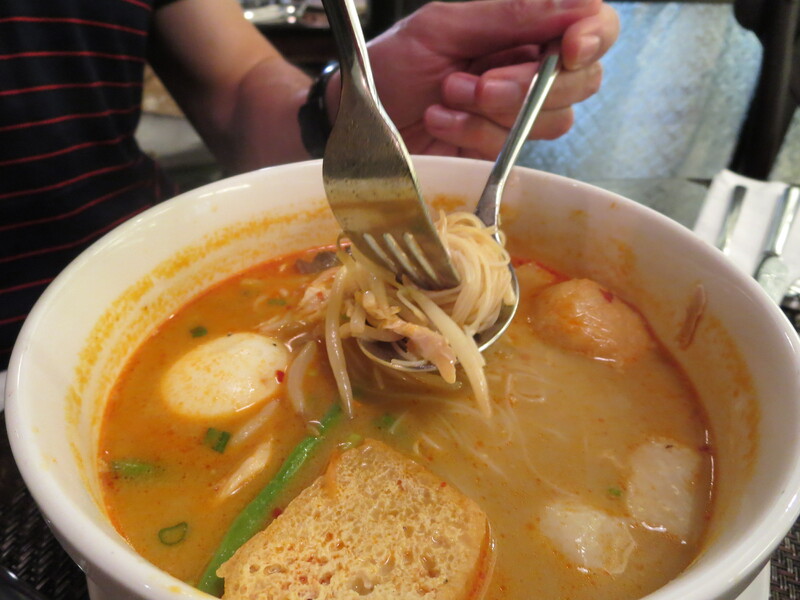 I skipped through all the ‘Western’ selections of eggs, pasta, grills and settled on the ‘Eastern’ local delights. This is after all Malaysia, and I should try improved Malaysian food right? 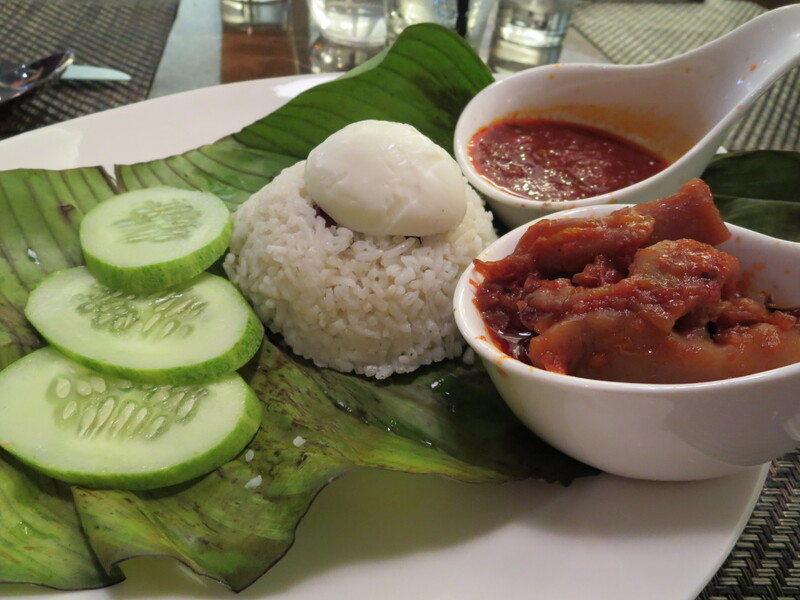 My Nasi Lemak is one-dimensional. One word – SWEET. Earlier, I saw the waiter taking a parcel wrapped in leaf from the bar counter top, presumably, my nasi lemak to zap in the microwave. But it was not warmed up properly, a tad cold, another disappointment. On top of my nasi is half a hard-boiled egg hiding some peanuts at the bottom. Also accompanying the nasi were cucumbers and 2 sambals; the sweet sambal ikan bilis and sambal cuttlefish. My mom liked the cuttlefish sambal and reckoned its been rehydrated from the dried cuttlefish. The nasi was fine, but didn’t tickle my fancy much. 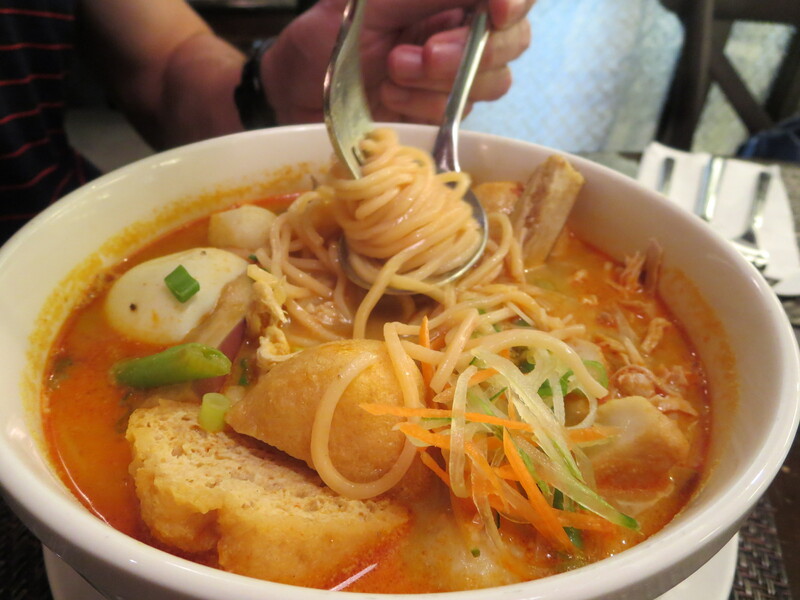 Mom ordered a bowl of Grandma’s Hokkien Mee which is a huge bowl of rice noodles with shredded chicken, veggies, bean sprouts, prawns, fish balls, fish slices, a hard-boiled egg as well as other condiments. 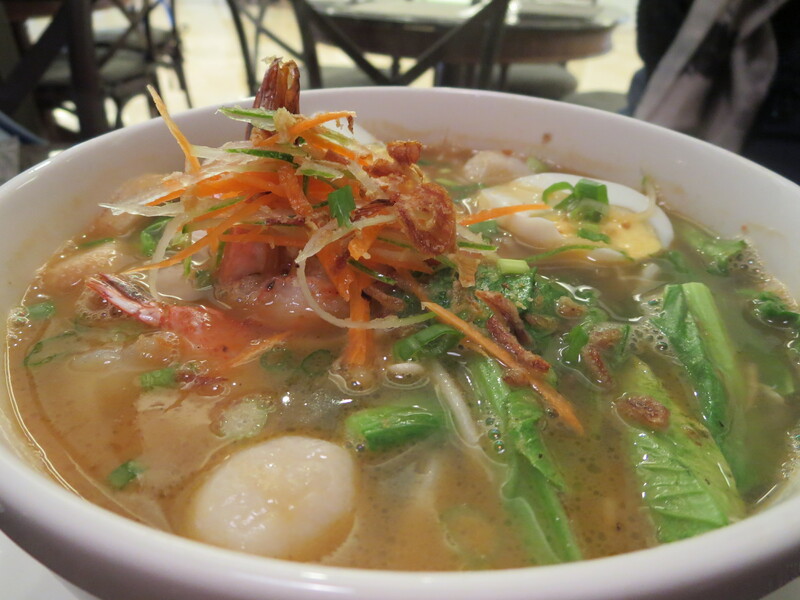 The comment that I got from her was ‘the broth is very flavoursome but simply too sweet’. I actually liked the interior of this bistro more than anything else. 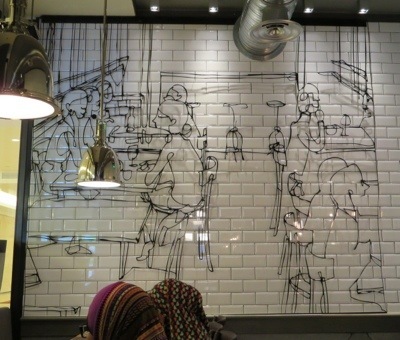 It’s very very cost effective and simply done using white tiles as backdrops for the metal wrought filigree of a sketch of caricatures eating out at a bistro. This gave an interesting twist and instant quirkiness to the interior. If you look closely at the photos, you see the bottles at the bar sitting on glass shelves. Again metal lattices were used to give a 3-dimensional visual layering of the wall as well as presenting the ‘presence’ of an actual drinks-shelf without the heaviness. 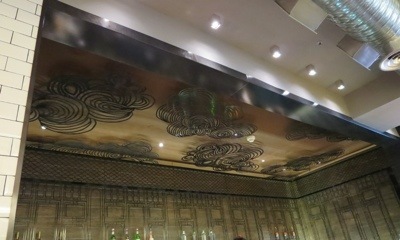 Even the timber ceilings have metal swirling clouds to give a visual interest to an otherwise boring ceiling. Unfortunately, the use of hard surfaces on walls, floor and ceilings made the side-walk cafe to be overbearingly noisy. With uncontrollable screaming children dining at the other end of the bistro, I had a rather miserable evening with ringing ears. 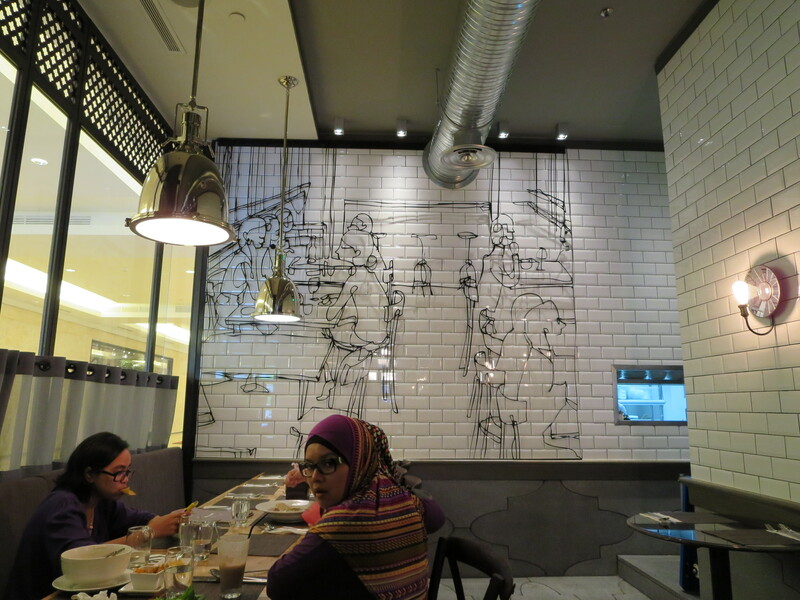 This entry was posted in Cafe, Kuala Lumpur, Restaurant Review, Side Ramblings and tagged Creative filigree, Eating at Suria KLCC, Halal Food, Melur and Thyme, Modern Malay Bistro, Restaurant Interior Design. Bookmark the permalink.